A beautifully flexible 5 star six bedroom villa in a small exclusive ocean front residential community on the northern coast of Koh Samui, for families or a group of friends. Should you tire of the sun beds or the sandy beach, there's the large private swimming pool and a games room. The best of both worlds really can be had at this ideally situated luxury villa: the quiet sandy beach of Maenam just a step down from the garden, and not too far away the vibrancy of some of the island's top spots. It is only a 20 minute drive to the main tourist centre of Chaweng, with its plentiful restaurants and nightlife, and to the island's international airport. The Santiburi golf and country club is 10 minutes away, as is Bophut and the charming "Fisherman's Village" with its historical shop house architecture. The villa is beautifully presented and furnished, using natural materials such as teak hardwoods, stone and marble, and the living rooms and master bedroom have exposed timber vaulted ceilings. A significant feature, which greets all visitors on entering, is the pair of antique style hardwood doors leading to a small courtyard with a central lotus pond and waterfall. 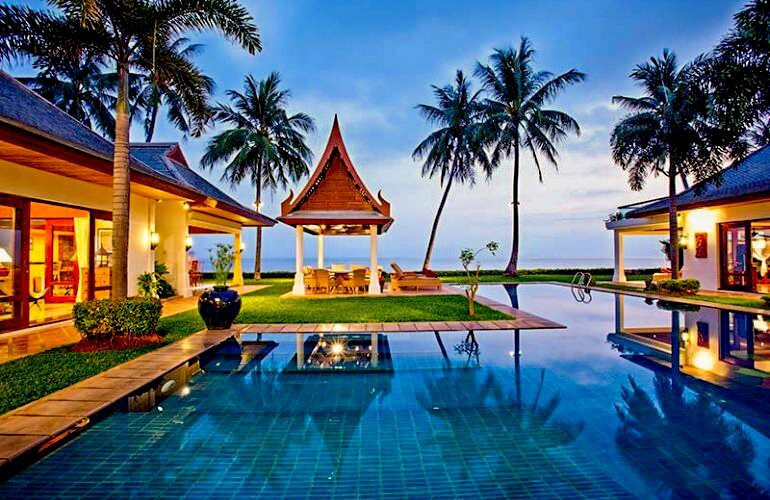 The villa's design is typically Thai, comprising three pavilions built around the large L-shaped salt-water swimming pool which runs down through the gardens and on towards the beach, passing a large garden sala set amidst the lawns. From these lawns there are two gated private entrances onto the beach. The décor of the pavilion interiors is primarily of cool and neutral colours, and local wooden wall carvings and freestanding statuary adding the detail to the villa's modern, clean and simple lines. All living areas, the kitchen and bedrooms are air conditioned and there are ceiling fans to the bedrooms, living room, open-air lounge and the sala. The open plan living pavilion is to the left of the pool, and includes a huge fully equipped western style kitchen, a dining room with a large table for 10, and comfortable sofas in the lounge area. A large plasma satellite TV/DVD and CD player are provided for entertainment, plus complimentary broadband Wi-Fi internet access. The open-air living area just outside the lounge is the perfect place for socialising and entertaining, with a bar, dining table for 10, a BBQ and a dartboard - and views across the lawns to the beach. Elephant statues keep guard by the large salt-water lap pool at the heart of the villa, surrounded by landscaped lawns and with a large sala at the beach end. Laze beneath the slowly circling ceiling fan in the sala on comfortable and relaxing seating and watch the fun in the pool, or contemplate the sands and lapping ocean. All six of the villa's bedrooms have teak floors, walk-in closets and marble-floored en suites. Five of the six en suite bedrooms are located in the rear pavilion, to the right of the lotus pond and waterfall. On the ground floor the 4th bedroom doubles as a games room with twin beds, its own satellite TV/DVD system, 8 ball pool table, foosball and comfortable seating for 10. The en suite has a washbasin and an indoor shower. A staircase from the games room leads up to a double bed suite on the first floor with its own satellite TV/DVD and a bathroom with twin hand basins and indoor shower. This double bedroom has its own balcony with wonderful views to the ocean. Next to the games room on the ground floor there are three twin bedded suites, both with twin hand basins, indoor showers, and bath tubs. The master bedroom suite is in the last pavilion, to the right of the pool. As well as its own walk-in dressing area, this suite also has study and office space. There are two double beds, a large sofa, and a plasma screen TV. As well as a Jacuzzi bath tub, twin hand basins, indoor and open-air showers, this magnificent en suite also features an inner garden. From the master bedroom doors lead to a terrace with outdoor furniture, and a stone staircase rises to a further roof terrace, equipped with additional sun loungers.